When we had the opportunity to review JumpStart.com membership I was excited since it is summer break and my kids are always begging to be on the computer. I don’t know about your kids but my middle son loves to get on the computer and play “games” when I say games I mean the ones that I have to limit his time since they are “just games” and not educational. Jumpstart is a win ..win situation for us. He is getting his computer time. And I know he is practicing learning skills in a safe environment. Here is a screen shot (on right) of my sons favorite math game, you have to find all the odd numbers ! Great parent resource - visit the Jumpstart blog ! JumpStart Jumping into the Wii World! Math Blaster: An Old Favorite Redesigned! Graders) and combines learning with exciting game play and stunning 3D landscapes to keep kids engaged and focused. The much-anticipated release of AdventureLand marks the next step in Knowledge Adventure’s move to transition the company to a multi-faceted kids’ entertainment company as JumpStart.com is quickly becoming the epicenter of online gaming for the 3-10 year old demographic. In AdventureLand, kids are invited to explore a mysterious lost island off the coast of JumpStart. After mastering the speed, skills and moves needed to survive the mission on Training Island, players are whisked off to Lost Island, where new adventures await around every corner. As kids explore mystical caverns, discover forgotten ruins and test their smarts on a trek to the peak of Mystic Mountain, they will have the opportunity to compete in multi-player games in real time. Plus, with the pesky trouble-makers known as Punk Punks attempting to thwart kids’ progress, it will take critical thinking skills, logic and speed to succeed. Buggy Racer: A brand new fast-paced racing game, Buggy Racer, is joining the cast of exciting games in the online world at www.JumpStart.com. In Buggy Racer, kids have the opportunity to drive a virtual dune buggy off ramps and around obstacles on a race to collect as many tiki heads as possible before time runs out. Multi-player mode adds a whole new level of challenge to the game by allowing kids to compete with others in real time from the comfort of their own homes. Plus, in multi-player mode, kids will find exciting surprises such as the ability to shoot ice bolts and freeze an opponent’s dune buggy! Dodge Bot: Available in the arcade at www.JumpStart.com, the new Dodge Bot game invites kids to test their speed with the mouse. As players race to uncover all the JumpStart treasure chests, the pesky little furballs known as Punk Punks will attempt to stop them. Only those with a sense of adventure and speedy fingers will be able to beat the top level of competition. Sound Bop: Sound Bop, the latest memory and concentration game from JumpStart, will also be joining the cast of exciting games in the online arcade. Sound Bop challenges kids to build musical memory by playing instrument sounds and asking kids to replay them in the correct order. 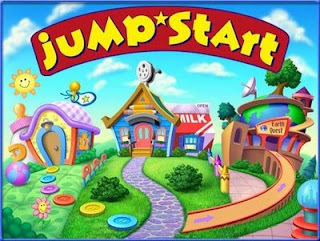 Now, as kids complete missions in any of JumpStart’s online virtual worlds, they will be rewarded with JumpStars. Players can visit the Hall of Fame to see how they rank against the top JumpStart players worldwide. As kids progress through the JumpStart games and pass major learning milestones, they will see their status change. 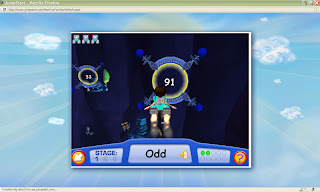 In addition, players are rewarded for completing learning games with coins. These coins allow kids to purchase limited edition virtual items like avatar clothing or house decorations to customize their world. Not only does this new coin-based economy encourage kids to succeed at learning games, it also teaches valuable lessons about money. The list of items available for purchase will soon expand to include pets, accessories and other exciting extras . Jumpstart is providing one lucky winner with a free premium 3-month subscription to the Jumpstart website! The Ghost Town Grab. Thanks. My son would love the Ghost Town Grab world. My son always goes to Adventureland. Story Land. My daughter loves stories and I bet this land would be fun. My son would LOVE all the lands, but I think Adventure Land would be his favorite. I think he would want to visit the Movie House? I'm sure my son would like to visit the arcade first! Story Land looks very interesting!